The government is working on multiple new policies to boost India’s economic growth and exports, says Suresh Prabhu, Minister for Commerce and Industry and Civil Aviation. In his message to the 45th National Management Convention of All India Management Association (AIMA), Prabhu said that the government will unveil the new industrial policy soon. He said that the government is also working on an agriculture exports policy and a logistics policy to make it easy to do business in all sectors of the economy. Prabhu also announced that 100 more airports will be built over the next 15 years to give a boost to logistics. Jayant Sinha, Minister of State for Civil Aviation, told the convention that the government is creating DigiYatra, a digital travel platform, to enable check-in and other airport services based on face recognition. DigiYatra will make the PNR active for four hours to enable entry at the airport, he said. He said that the government is replicating the learnings from the digital payment platform, UPI, to other areas, including healthcare. He said that Ayushman Bharat is a healthcare platform to enable cashless treatment anywhere in the country. The Minister made a power point presentation at the convention making a case for junking the orthodoxy of the farm-to-factory development model in favour of a farm-to-frontier model. He argued that it was less important for India to achieve a $10 trillion GDP by 2030 than to fulfil people’s aspiration for a better life, and to do that India had to transfer people from farms directly to high-value supply chains. He gave the example of the drivers who have become more productive without any further skills by joining the ride sharing and food delivery platforms. The minister said that even to get to the $10 trillion GDP target, India had to create 2 million direct ‘frontier’ jobs with per capita output of about $10,000 each year. There are only 10 million such jobs in India at present and most of these are in the finance and the tech sectors. “Each direct frontier job creates 3 indirect jobs in the formal economy such as guards and drivers,” he said, adding that his voter does not want a job in the informal economy. The onus of creating high-value jobs was on the private sector, he said, because the government jobs cannot grow. Hindustan Unilever Chairman and Managing Director, Sanjiv Mehta agreed with the Minister and said that India could not take the slow route to change and it had to fold the future in to grow fast. He said that in the new economy, data was the magic potion and because of the extensive data produced by increasing digitization, hundreds of startups were coming up every month. “The startups are showing the way and the old economy has to shake off its ennui,” he said, adding that India needed to raise its growth rate to double-digits as an 8% GDP growth rate will not be enough to make India a $10 trillion economy by 2030. AIMA President, TV Mohandas Pai said that the startups have begun leading the economy and they were attracting huge foreign investment and creating jobs in large numbers. “Each day, some startup is raising a billion dollars,” he said. Baba N Kalyani, Chairman and Managing Director, received the Managing India Award on behalf of his company for the ‘Indian Multinational of the Year’. Jayant Sinha presented the award. Sinha also conferred AIMA’s Life Fellowship on Sunil Kant Munjal, Chairman, The Hero Enterprise and Sanjiv Mehta, CMD, Hindustan Unilever. The National Management Convention is a 2-day event and it includes presentations and panel discussions on the key economic and leadership issues. The overarching theme of the NMC is ‘Leadership in the Age of Disruption: India@2030 – Creating a $10 Trillion Economy’. 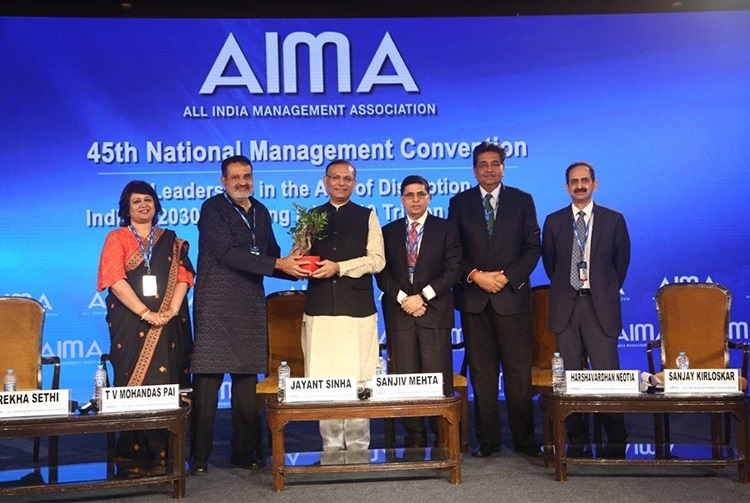 The All India Management Association (AIMA) is the national apex body of the management profession in India. Over the last five decades, AIMA has contributed immensely to the enhancement of management capability in the country. AIMA has a broad base of 64 Local Management Associations including two cooperating LMAs abroad, with a membership crossing 30,000 in number. AIMA is a non-lobbying organisation, working closely with Industry, Government, Academia and students to further the cause of the management profession in India. AIMA is represented on the Boards of India's premier Business Institutions like Indian Institute of Management – IIMs. AIMA is also represented on Boards of Government bodies including the All India Council for Technical Education, National Board of Accreditation, National Productivity Council to name a few. AIMA makes a salutary contribution to management learning and practice in the country by offering various services in the areas of testing, distance education, skill development & training, research, publications and management development programmes.